The beginning of Summer Set-Up weekend, the biggest event of its kind for the year! Over two days, the Denma Ling landscape will get its brand new summer look. A tent city will arise, ready to host the hundreds of participants coming for the busy summer programs. Dorje Denma Ling is looking for Summer Set-Up volunteers. This weekend, full of energy and enthusiasm, is a unique opportunity to become the part of the Centre’s ensemble and to experience the pleasure of serving others. Over the course of the weekend, volunteers assist our Facilities crew with the preparation of campsites, tent set up, cleaning and furnishing. 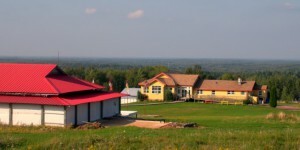 This important help, and the experience of meditation in action, is accompanied by twice-daily formal sittings and chants, organic local food, an opportunity to connect in community, and to taste life at a Shambhala land centre. There is no cost for this weekend and food and tent accommodation are provided. Are you curious about this experience? Interested in the practice of serving others? Go for your unique weekend here! If you have any questions, please email personnel@dorjedenmaling.com.